Imagine, if you will, that at the end of the original Halloween, Michael Myers was captured and incarcerated for the rest of his unnatural life. 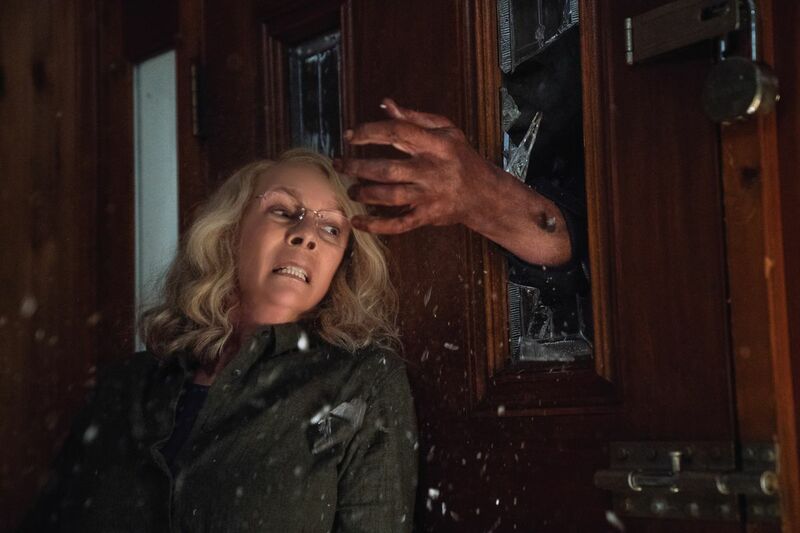 And imagine further that Laurie Strode never fully recovered from the psychological trauma that resulted from Myers’ attempt to kill her, and she spent the next 40 years of her life preparing for his eventual return to finish the job. And then, one night, return he does. That is the premise of this spanking-new Halloween from Blumhouse Productions, the studio behind horror hits such as Get Out, Insidious, The Purge, Split, Upgrade, Sinister and The Gift. It’s directed by David Gordon Green and written by Green, Jeff Fradley and Danny McBride. And these guys sure do know their Halloween mythology – which is why they have pretty much discarded it all and gone back to square one by making this a direct sequel to the 1978 classic. It’s a clever conceit that works very well. Gone is the revisioning of 1981’s Halloween II that made Laurie Strode (Jamie Lee Curtis) a long-lost sister of Michael’s. That little plot twist has always bothered me – it never made any sort of sense – so I for one am glad to see it gone. Adding that backstory to explain why The Shape was so hellbent on slaughtering Laurie was a big mistake – Halloween worked so well because The Shape was nothing more than an inexplicable and unstoppable force of evil. We never knew WHY Myers stalked and slashed, which made him all the more frightening. Giving him a reason (albeit a form of sibling rivalry) really softened the horror. Michael is a monster, and there really is no need to explain the behaviour of a monster. Halloween has often been imitated – mostly by its own increasingly dire sequels – but never bettered. However, now we have a film that comes pretty close to living up to the smarts and the terror of the original. In a nice modern touch, this new Halloween opens with a pair of true-crime podcasters visiting Michael at the Smith’s Grove Sanitarium in the hope of getting an interview with the infamous serial killer. Michael’s psychiatrist, Dr Ranbir Sartain (Haluk Bilginer) – Dr Loomis has long been dead – tells them that Michael can speak, but he chooses not to. In an attempt to get him talking, they show Michael the mask he wore on that fateful night, and mention sole survivor Laurie. Bad move. The next day, as Michael is being transported from the sanitarium to a new maximum security prison, Michael escapes and heads back to Haddonfield, Illinois, to finish what he started 40 years earlier. Plot-wise, Halloween is not terribly original – there’s nothing here we haven’t seen before – but thanks to a sharp script and a genuine love for the source material, the filmmakers manage to craft an atmospheric and genuinely scary horror movie. It helps that John Carpenter is on board as an executive producer, as well as crafting the film’s score (with the help of son Cody) and reprising that classic theme music. Also on the perfect-casting front is the return of Nick Castle to play Myers, aka The Shape. You may recall that Castle played the psycho killer in Carpenters original film, so it’s a lovely piece of continuity to have him reprise the character 40 years later. But the most perfect piece of continuity is to have Curtis back as final girl Laurie Strode. And the fact that this is a direct sequel to the first film, ignoring everything that has come since (including those two awful Rob Zombie reboots) gives her the perfect clean slate to play with. And play with it she does. For a start, Laurie has an almost identical hairstyle to the one she wore in 1978 (although here it’s greyer). Curtis plays Laurie as a woman with post-traumatic stress, who has spent the past 40 years preparing for Michael’s return; in many ways, she is reminiscent of Sarah Connor in Terminator 2. This obsession has caused her estrangement from her daughter Karen (Judy Greer), but Laurie has managed to form a closer bond with her granddaughter, Allyson (Andi Matichak). And it’s no spoiler to say that it’s obvious from early on that these three woman will come together to take on Michael Myers in the climax. There are plenty of other nods to the original film – this sequel does offer up a lot of fan service, for which it has been unfairly criticised. Because, if you think about it, why would someone who is NOT a fan of the Halloween films go to see a new Halloween film? And with the filmmakers themselves clearly massive Halloween fans, there is plenty here to keep the most ardent and eagle-eyed fans on their toes – such as a scene with Allyson and a couple of her high school friends walking down a Haddonfield street that is remarkably similar to a scene in the first film. Or the original Haddonfield house popping up in a most unexpected way. The most pleasant surprise of all is that this Halloween is genuinely scary. Yes, it does opt for a lot more gore with the kills than Carpenter’s original did – modern audiences have coem to expect as much – but it does manage to ramp up the tension throughout, with Green knowing just how much to show (or, as the case may be, not show). There’s plenty of humour too, as you’d expect with McBride on script duties, but that in no way detracts from the terror. What really helps drive the film is the well-written and well-rounded characters, from the three leads through to other inhabitants of Haddonfield. The filmmakers take the time to develop the characters as real people with real lives, which makes you care all the more as Michael bumps them off; poorly-drawn characters have been the downfall of many b-horror films, but on that front, Halloween doesn’t let us down. It’s safe to say that this really is the Halloween we’ve been wanting for 40 years, and it’s been well worth the wait.